Two main types of vessels are used for growing microgreens: containers and trays. 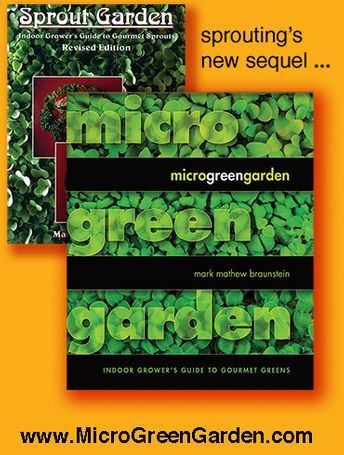 For TRAY GARDENING, please consult the book or eBook of Microgreens Garden, available from your bookseller. This website is devoted solely to CONTAINER GARDENING. Gardeners call this method bottom watering. 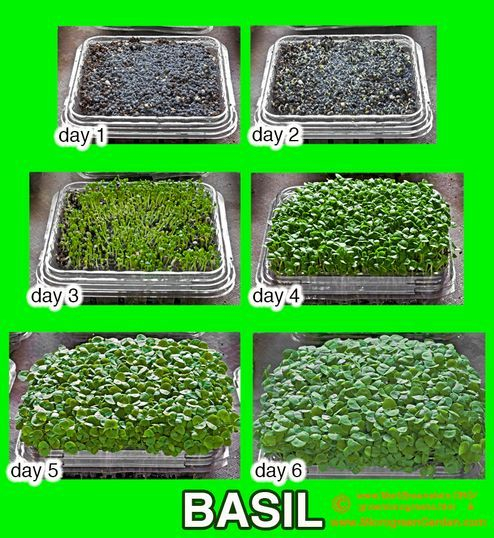 Do this whenever the top of the soil feels dry, usually once daily for shallow half-pint containers, and every other day for deeper pint containers. Fill a bowl or basin or small tub with room temperature water approximately to HALF the height of the pint or half-pint container. By room temperature what really is meant is root temperature, else cold water chills the roots and thereby delays root growth. Place the container into the water. The numerous vent holes in the bottom of the plastic container allow for soaking now and for draining later. Let the container soak up water for a minute or less, until the surface of the soil feels thoroughly moistened. Next remove the container from the water. Replenish the water in the pool as needed, usually after every fourth or sixth container. Watering containers one at a time in a small bowl of course takes longer than four simultaneously in a larger basin. Repurposed shallow drawers from old refrigerators can fit six containers. Whether one or four or six at a time, you can never waste your time waiting during soaking cycles because the kitchen is the one room in your home where there’s always something more to do. Allow the container to drain for a minute or more. Set it at a slight angle inside the sink or dish rack. If you live without the luxury of an automatic procrastinator, also called an automatic dishwasher, this daily ritual around the kitchen sink provides a constant incentive to wash your dishes soon after every meal rather than let them pile up. Once you’ve completed a cycle of watering, if you did not line the bottom of the container with paper then some soil will remain behind in the bowl or tub of water, especially for the first few days before rootlets entwine themselves into the soil. The higher the water level, the less time needed for soaking. But the lower your water level, the less soil you might find left behind in the water. After repeated waterings, soil just might clog the drain of your sink (though it never yet has clogged mine). So filter the water while draining it. Sprout jar lids with fine mesh screens provide perfect filters. Or toss the remaining water outdoors. Or feed it to your houseplants, your inedible ones, as microgreens are your edible houseplants.